The thyroid is a small butterfly shaped gland in the base of your neck, it is responsible for manufacturing hormones that regulate your body’s metabolism. Hyperthyroidism is when the thyroid gland is overactive and produces too much of its hormone. Hyperthyroidism affects around 1% of women and is less common in men. Graves’ disease is the most common cause of hyperthyroidism, it affects around 70% of people with an overactive thyroid. Nodules on the thyroid – a condition called toxic nodular goiter or multinodular goiter–can also cause the gland to overproduce its hormones. 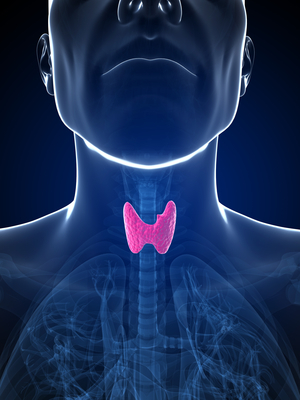 High thyroxine and low TSH levels indicate that your thyroid gland is overactive. Treatments for hyperthyroidism destroy the thyroid gland or block it from producing its hormones. Antithyroid drugs prevent the thyroid from producing hormones, a large dose of radioactive iodine damages the thyroid gland, and surgery can be performed to remove your thyroid gland. If you get your thyroid removed than you will need to take a thyroid hormone daily. Hypothyroidism is when the thyroid gland is underactive and does not produce enough of its hormone. It is often caused by Hashimoto’s disease, surgery to remove the thyroid gland, or damage from radiation treatment. Most cases of hypothyroidism are mild. The main treatment is to take thyroid hormone pills. It is important to get the dosing right when taking these pills because taking too much can cause hyperthyroidism. Exercise For optimal thyroid function, exercising for at least 40 minutes a day, three days a week is a must. While all forms of exercise are valuable, when it comes to hormone production, moderate-intensity aerobic activity will produce the best benefit.